Susan Hapgood, an American curator who moved to Bombay a couple of years ago, has opened a small not-for-profit space in Colaba called the Mumbai Art Room. The gallery's first show features a single ten-minute video by the Swedish artist Nathalie Djurberg, who specialises in painstakingly crafted claymation. 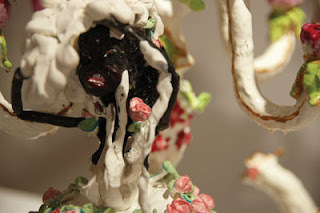 I Found Myself Alone puts a spindly black ballerina on a table set for afternoon tea. She dances awkwardly between creamy confections and baroque crockery before being doused by wax from a candle. She cleans herself of the goop after a struggle, but soon faces a second attack. Eventually, she seeks revenge on whiteness by using coffee from the pot to stain the linen and porcelain. The battle between black and white gestures to histories of colonialism and immigration, but any moral drawn from the narrative is as discomfiting as the work itself becomes beyond its cutesy opening moments. Djurberg's use of the tactility of plasticine and her partner Hans Berg's eerie musical score make I Found Myself Alone fascinating to watch. The Mumbai Art Room is situated bravely on the ground floor of a large residential building, and news has got round about the entertainment on offer inside. Students of the Navy Children School next door are regular visitors. In the short time I spent in the gallery, four girls and then five boys walked up to the glass doors, peered inside for a minute, before entering, sitting themselves on the floor, giggling and whispering loudly, and being shushed by the gallery manager. It's good to see this connection with the neighbourhood, which is obviously something Susan Hapgood wants to take further. It does, of course, restrict the kind of art she can show. I can't imagine, for instance, that Nathalie Djurberg's more graphic stuff would be welcomed in this location. Here's a portion of a video by Djurberg screened at the 2009 Venice Biennale, where she won the Promising Young Artist award. It's reminiscent of Salvador Dali's canvases Premonitions of Civil War and Autumnal Cannibalism, which must have been as disturbing in their time as Djurberg's work is in ours. Oreos were on my mind for quite a while after, so worry not, you're not alone.